For six hours on Sunday December 10th, 2017, the Prince George RCMP had police vehicles at three local Save-On Foods stores and asked the public to help to “Pack-A-PC” (police car) with non-perishable foods. Police officers, Detachment staff, and volunteers donated their time in front of each store collecting the donations. On Monday December 11th, 2017, representatives from the Prince George RCMP with help from students from the John McInnes Centre, delivered a cube van full of non-perishable food along with cash & gift cards to the Prince George Council of Seniors. 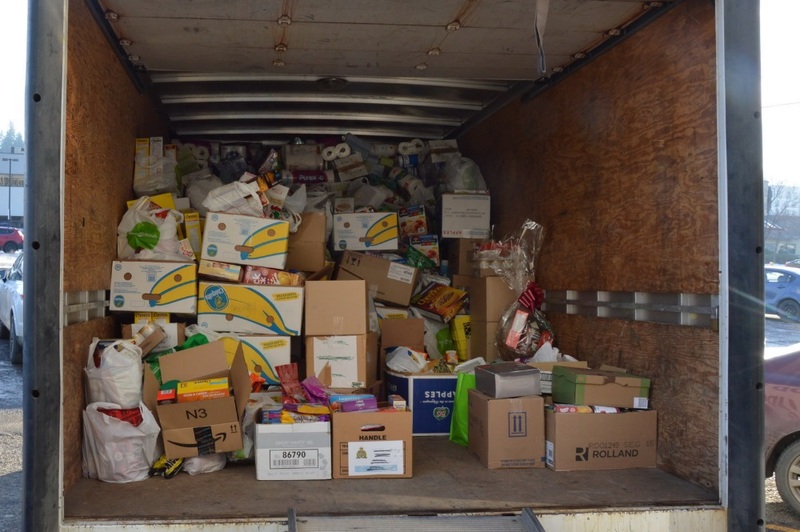 “The people of Prince George have once again stepped up and made a huge contribution to seniors in need this holiday season” says Bev Livingstone, City of Prince George municipal employee that organized the event. “We never imagined that we would surpass last year’s donations, but we did! The event was hugely successful. Food donations filled over 22 police cars surpassing last year’s total of 20. Cash and gift card donation topped $4000, eclipsing last year’s $3600.